Listen, some babies just can’t be hemmed with your bourgeois fences and square society rules, ya dig? In this world, you either get busy livin’ or you get busy dyin’, and even though this baby might only be 6 months old, they ain’t go no plans to let life pass them on by. They’re looking for adventure, which means they gotta be out on the open road, feeling those motors runnin’ and letting those two fat wheels take ‘em wherever that pavement leads! Yeah, that’s right: This baby’s gonna make it happen, and then take this world in a love embrace (whatever that means)! Which means you’ve got one of two choices: You either get on the back of their bike (or hop in the sidecar, which would honestly be our preference, since it balances the motorcycle out…after all, have you seen the way your baby steers a bike??) or you get out of the way. Cause this baby is going somewhere fast, and you’re in or you’re eating his dust. 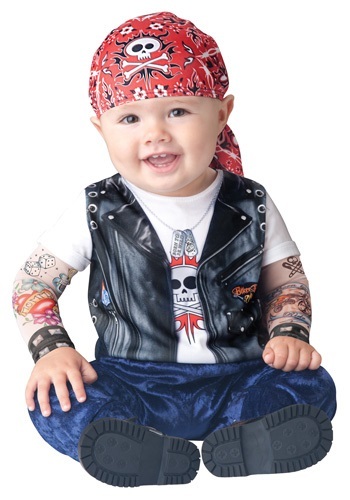 But either way, before that baby peels outta the front drive, make sure he's ready for some easy ridin' with this Baby Born to be Wild Bike Costume! The jumpsuit includes a screen-printed vest and shirt, as well as attached blue velour pants that have snaps along the legs (for, you know, extra motorcycle riding comfort!). The shirt also has fake tattoo sleeves, saving you and your baby the hassle of inking up his arms with expensive, permanent drawings of bald eagles, American Flags, and sweet-but-manly hearts. The costume even comes with a red bandana that has printed skulls on it and can be fitted on your baby's head with elastic band. Basically, this Baby Born to be Wild Bike Costume has got all the rugged looks of a road toughened biker, but without all the reputation-busting and possibly law-breaking side effects of being in a street tough motorcycle gang!